Next on the Italian tourist trail, the Norms have headed for Florence, for shopping in Milan was deemed inappropriate in the current economic climate. Taking inspiration from the significant artistic and architectural heritage of a city which was at the centre of the thriving artistic Renaissance, producing masterpieces such as Michelangelo’s David, the Giotto frescoes of Santa Croce, Botticelli’s Venus and the vast collections of the Medici tribe, this Norm has turned all artist, setting up his easel on the banks of the River Arno. From there he can enjoy a perfect view of the famous Ponte Vecchio, a street of merchants suspended across the river, and atop of which a secret corridor links the Palazzo Vecchio to the Palazzo Pitti – genius! Patiently, Artist Norm is recreating this magnificent view across the surface of his canvas, while a fellow tourist prefers the medium of photography to capture his impression of Florence, a city which is so beautiful, that it needed to be captured twice, reflected in double form in the waters which run peacefully through its centre. What a delightful way to savor the scene. Very cute. 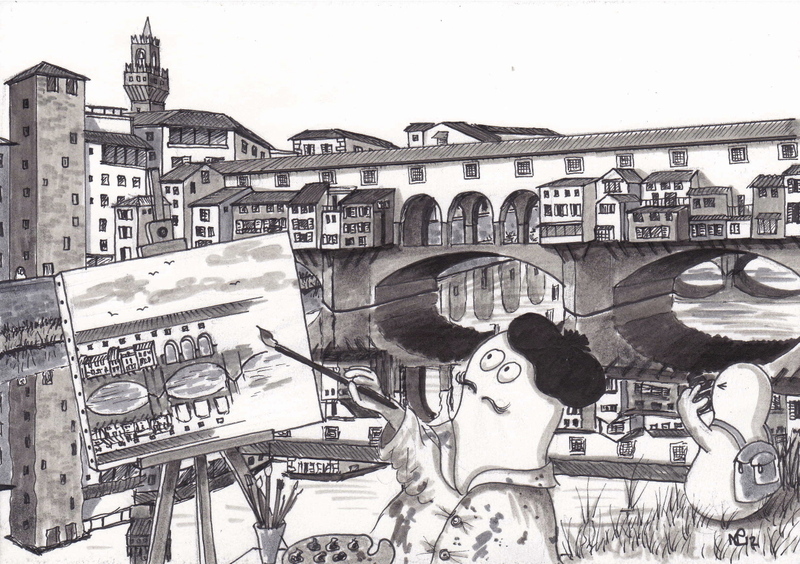 I recently did a sketch of the Ponte Vecchio bridge as well while I was visiting Florence. A-DO-RA-BLE! But one question, are they left/right armed forever, or the Norms can change their arm position?